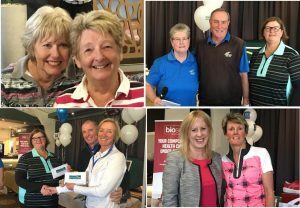 On Wednesday 29th August the Ladies held a very successful annual Charity Gala Day in aid of The Girls Refuge Leichhardt and our Farmers, raising in excess of $15,000 for these worthy causes. The weather was sparkling and the course was in great condition for the 109 players competing in three divisions. The winners of the Women’s competition were Daphne Storm and Jennifer Bishop, the Mixed was won by Dawn and Geoff Connellan and the Men’s by Dave Hilton and Michael Saroufim. Gary Ryan scored a Hole-in-one on the 11th hole on his first shot of the day!! The Ladies Committee would like to thank all those who dug deep into their pockets especially our major sponsor Cardinal Freeman Retirement Village. Thanks to Drummond Golf Stanmore for providing the prizes, and other businesses and members for their generous support. Well done to the Ladies Committee and Gala Day organisers for their hard work making the day so successful, and thanks to Tony and Johanne for their assistance.